Menstrual Doodles is a fabulous little book. Little it may be, but it is rich in practical information. Written in a light and humorous style, it brings on a wry smile and even made me laugh out loud a couple of times! It successfully conveys both pragmatic advice and joyful enthusiasm for the wonders of the menstrual cycle, and how to unearth them. “The menstrual cycle is an amazing gift that goes way beyond child-rearing potential”. 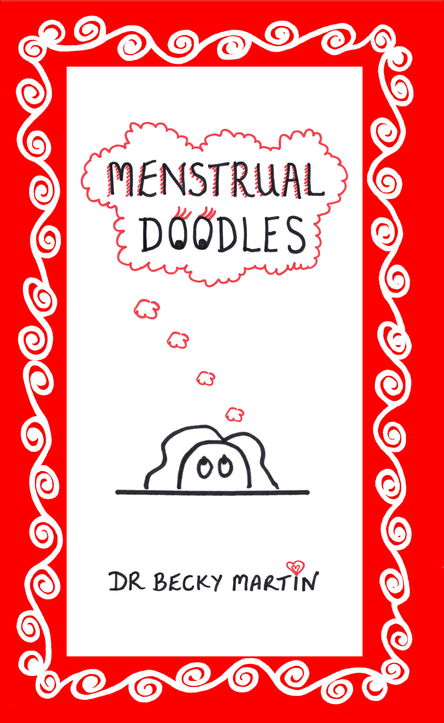 Becky has created an innovative style in which to convey her deep understanding of all things menstrual. Each page has funny cartoons created with the observational wit of what our cycles are really like. There is realistic advice for each of the four phases of the cycle: dealing with the challenges and making the most of each phase. The health tips, including good foods to eat, are based on scientific research plus there are helpful facts to know more about your body and how it works. Health conditions related to the cycle are covered to enable you to spot if you might have one of these and seek medical advice. There’s also information about reusable period products. Menstrual Doodles is a perfect introduction to looking at the menstrual cycle in a different way to the norm, for women who struggle with parts of their cycle or young women who have just started their periods. It’s also an inspirational and entertaining read for women who already track their cycles and life their lives in sync with them as a reminder of new things to explore.